The landscapes of the North Pennines inspire the fantastic arts and crafts being produced in the area, in the footsteps of greats like JMWTurner. The North Pennines abounds in two-wheeled excitement and adventure! There is something for everyone, from family friendly routes to moorland singletrack. The North Pennines offers a range of opportunities for horse riding, from leisurely guided pony rides to technical upland hacks. The North Pennines has excellent information points where you can find people with a wealth of local knowledge and local information. The North Pennines has abundant wildlife and boasts nationally important hay meadows, blanket bogs, moorland, woodlands and rivers. There are several organisations and businesses in the North Pennines which provide great outdoor education opportunities. The North Pennines has a vast walking network, from the Pennine Way to easy access circular walks making it a great place to go for a walk. The North Pennines Area of Outstanding Natural Beauty and UNESCO Global Geopark is a stunning landscape of sweeping moorland views, cascading waterfalls, colourful hay meadows, vibrant communities and spectacular wildlife. With a rich industrial heritage, some of the best walking, cycling and horse riding in the country, great days out for families and much, much more you’ll be sure to find something to interest you throughout the year. 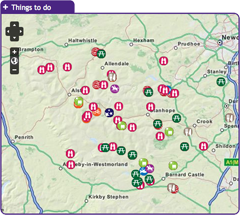 To discover what the North Pennines has to offer click on the interactive map and start exploring!